In 1891, the parish was placed in the new "Grantham South" sub-district of the Grantham Registration District. 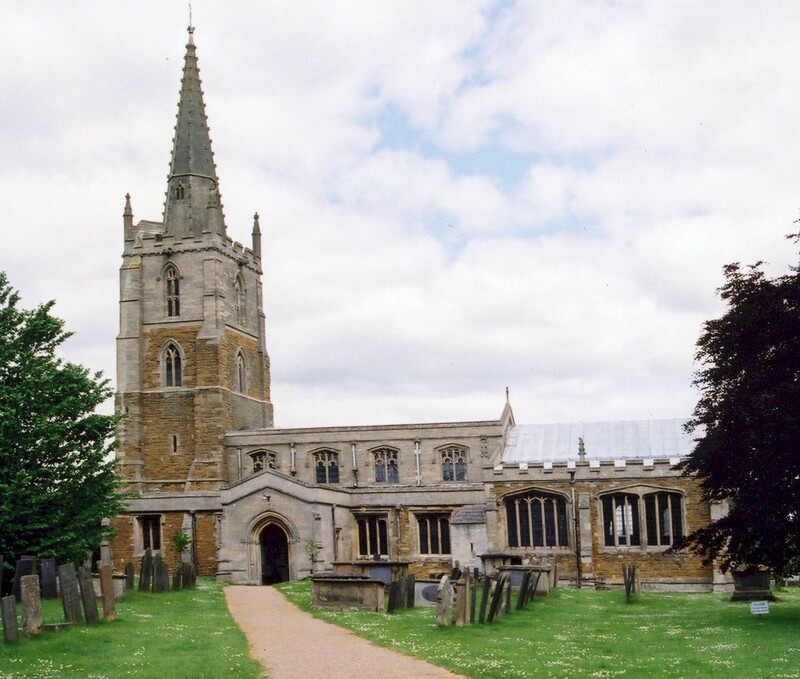 You can also perform a more selective search for churches in the Harlaxton area or see them printed on a map. The Anglican parish church is dedicated to Saint Mary and Saint Peter. The church is an ancient structure, parts of which date back to 1323 or earlier. The spire was restored in 1885. The inside of the church was renovated in 1890 - 1891. J. HANNAH-BRIGGS has a nice photograph of Sts Mary & Peter Church on Geo-graph, taken in March, 2012. Richard CROFT has a photograph of the church interior on Geo-graph, taken in 2008. Parish registers exist from 1558 and include entries from Wyville with Hungerton (to the south) up until 1813. Bishop's Transcripts exist from 1812 to 1843. Parish registers for 1558 thru 1808 are also on deposit at the Lincolnshire Archives. Parish registers are on file at the Society of Genealogists, covering 1559 - 1837. Parish marriages from 1651-1750 are covered in Boyd's Marriage Index, and from 1790-1837 in Pallot's Marriage Index. The LFHS has published several marriage and burial indexes for the Grantham Deanery to make your search easier. In the early 1900's, the parish was in the South Grantham Deanery. The Wesleyan Methodists had a small chapel here before 1871. Check our Non-Conformist Church Records page for additional resources. Harlaxton is both a village and a parish. The parish is about 108 miles north of London and lies about three miles southwest of Grantham on the old Melton Mowbray road (now the A607). The parish itself is bounded on the north by Barrowby and Grantham parishes, to the west by Denton, on the south by Stroxton. The parish covers about 2,700 acres. It is probably easiest to take the A607 southwest off the A1 Motorway for about two miles. Visit Harlaxton Drift (8.36MB of photos) where it runs down to the canal. Kate JEWELL has a photograph down Main street on Geo-graph, taken in 2005. Ask for a calculation of the distance from Harlaxton to another place. You can see the administrative areas in which Harlaxton has been placed at times in the past. Select one to see a link to a map of that particular area. There are monuments and brasses of the DE LIGNE family in the Anglican church dating to 1682 and to the STROOD family in 1498. The GREGORY family, heirs to the DE LIGNE line, are also evident, with items dating to the 1800's. In 1740, an urn containing burnt bones and Roman coins was found in the parish. John of Gaunt had a hunting seat here. A local plowman unearthed a brass pot which contained a gold and jeweled helmet and it was immediately assumed to be John's. The helmet was presented to Catherine, dowager queen of Henry VIII, who deposited it in the royal cabinet at Madrid. A Flower Show is held annually, usually in August, at St. Mary and St. Peter's Church. The Gregory Arms Public House dates back to the 19th century. The parish Squire did not like to see his workers drinking on Sunday, so he moved the pub. to just north of the village and restricted the pub's license to a six-day-a-week certificate. Today they are a Grade II building listed by British Heritage and they operate seven days a week. Kate JEWELL has a photograph of The Gregory Arms on Geo-graph, taken in July, 2005. In 1871, nearly all of the parish was held by Mrs. Sherwin GREGORY of Harlaxton Manor. In 1913, the greater part of the parish was held by Thomas Sherwin PEARSON-GREGORY. The original Harlaxton Manor was an ancient structure, built in the valley next to the village and was purchased by the DE LIGNE family around 1475. It was demolished in 1857 by Gregory GREGORY after it had sat, unoccupied, since about 1780. A new Harlaxton Manor was built in 1837-45 in the Jacobean style from local stone. The manor boasted 100 bedrooms. The Baron's Hall is 75 feet long and 30 feet high, with a lovely marble floor and ornamented with oak wainscotting. From the new Manor House one can see Belvoir Castle and the Vale off to the west. Harlaxton Manor was the seat of the PEARSON-GREGORY family in 1913. The Manor House was allowed to fall into disrepair and was virtually derelict when purchased in 1937 by Mrs. Violet VAN DER ELST, a self-made successful busineswoman who made her fortune by developing and selling Shavex, the first brushless shaving cream. She renamed the property "Grantham Castle". She put a great deal of her fortune into restoring the manor and into her fight against capital punishment. A year after capital punishment was banned in the Kingdom, she died penniless. Harlaxton Manor is now owned by the University of Evansville, Indiana, USA, and is used as their British campus as Harlaxton College. Kate JEWELL has a photograph of Harlaxton Manor gateway on Geo-graph, taken in July, 2005. Kate JEWELL has a photograph of Harlaxton College on Geo-graph, taken in 2005. The Royal Flying Corps (RFC) opened an airfield here in World War One in November, 1916. During WWI the field was a busy training field and was eventually designated a Training Depot Station. The field was closed in May, 1919. There is a marble tablet in the church in memory of the men of the parish who perished in World War I. The RAF reopened the field in late 1941 as a relief landing field for RAF Spitalgate. The field was closed again late in the 1950s. The field is listed on the Aviation Heritage Trail. Alick Thomas Bentall CHARLESWORTH, 2nd lieut., RFC, age 24, died 30 May 1917. Husband of Elizabeth Rosina May CHARLESWORTH of Victoria, BC, Canada. Cecil HARRIS, priv., 3rd Btn. Lincs Regt., age 24, died 23 May 1918. Son of Andrew and Lizzie HARRIS of Harlaxton. Stanley Keith MUIR, captain, RFC, age 25, died 12 Sept. 1917. Son of John Franklin MUIR, Victoria, MLB, Australia. Stanley Arthur RUTLEDGE, lieut., 28th Btn. Canadian Inf., age 27, died 16 Nov. 1917. Son of Edward S. and Anna J. RUTLEDGE of Fort William, Ontario. The name derives from the Old English Herelaf+tun, meaning "estate or farm of Herelaf". It appears as Herlavestune in the 1086 Domesday Book. White's 1872 Directory lists the following surnames in the parish: BAILEY, BARKER, CABORN, CHALLANDS, DOLBY, FYFE, GARFIT, GREGORY, HALL, HARDWICK, HEMSLEY, HEWERDINE, JACKSON, NOON, PALETHORPE, PIKE, PULLEN, ROSE, SCOTT, SCHRIMSHIRE, SHELBORN, SUMMERFIELD, TOWERS, VINCENT, WESTON, WHITTLE, WOODRUFF and WYER. Kelley's 1913 Directory lists the following surnames in the parish: BRAMLEY, BURTON, CHALLANDS, CHIPPS, COLLIN, GEESON, GLASSOP, HARRIS, HARRISON, ISAAC, JEUDWINE, PEARSON-GREGORY, PICKWORTH, SAYWELL, SINGLETON, SUMMERFIELD, WADE, WELBY and WILSON. The parish was in the ancient Loveden Wapentake in the South Kesteven district and parts of Kesteven. The parish is also within the boundaries of the Grantham Soke. Bastardy cases would be heard at the Spittlegate petty session hearings. In 1632 John USHER of the Isle of Ely deposited £10 so that the interest could aid the poor of the parish. In 1701 Edward DE LIGNE did the same. In 1730, Cadwallader GLYNNE left an annuity of £5 to be distributed to the poor as money (normally the poor would receive coal or food from such charities). In 1742 Cassandra BEAUMONT gave £10, the yearly interest to be laid out in books. The Common Land was enclosed here in 1798. A number of Poorlaw records for 1701 thru 1857 are on deposit at the Lincolnshire Archives. A timbered school was first built here in the 1600's. A Public Elementary School was rebuilt here in 1871 and was attended by 83 in 1913. The school is currently located on New Beacon Road, NG31 9LJ, telephone: 01476 564417. There is a Harlaxton school web site, but it contains little useful information.